If you are a consumer looking for an exceptional SUV in the Denver area, you should check out the 2019 Jeep Wrangler. The new Wrangler comes with four trims that include the Sport, Sport S, Sahara, and Rubicon. Serving Denver Colorado consumers, our team at Pollard Jeep will be happy to answer any questions that you have about this model. The exterior design offers rugged styling. This model comes with Jeep’s iconic seven-slot grille and headlamps. There are a number of wheel styles to choose from with the Wrangler that can support up to 35-inch tires. The Sport comes with 17-inch black styled steel wheels, and the Sport S offers 17-inch polished granite crystal wheels. The Sahara trim comes equipped with 18-inch polished wheels with tech gray spokes, and the Rubicon comes with standard 17-inch polished wheels with black pockets. The Rubicon also offers available 17-inch black wheels with a polished lip, and the Sahara offers available 18-inch tech gray wheels with a polished face. The exterior also offers an available Sky One-Touch Power Top that is a new feature with the Wrangler. This lets you open the top of the Wrangler in only 20 seconds with the touch of a button. 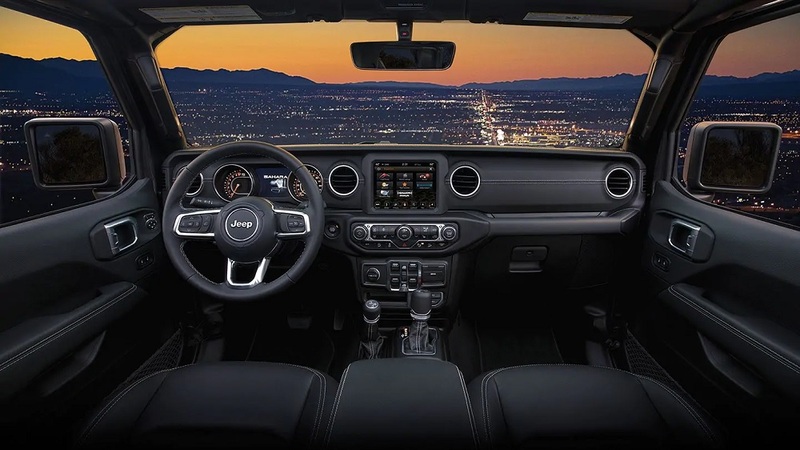 The interior of the 2019 Wrangler comes with an award-winning available infotainment system. The Uconnect 4C NAV is paired with an 8.4-inch touchscreen and supports Apple CarPlay and Android Auto. With this infotainment system, you can choose the SiriusXM All Access Package, Bluetooth connectivity, integrated Voice Command, and Navigation. 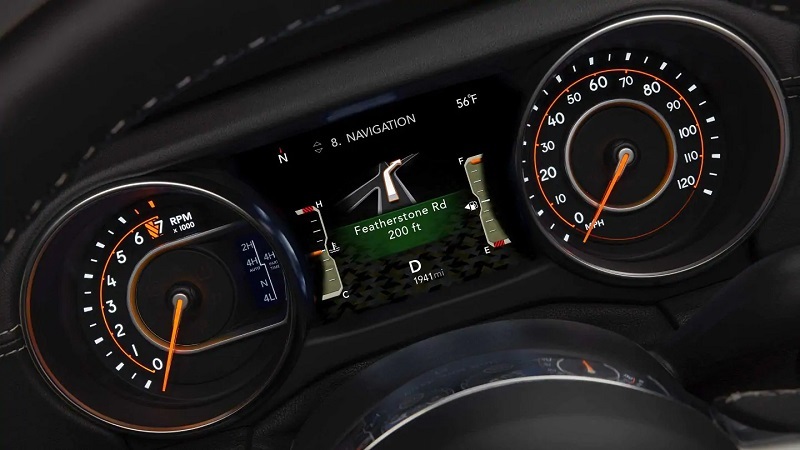 There is also an available 7-inch Driver Digital Cluster Display that lets you stay informed about active safety and security features, vehicle speed, radio information, Navigation, and more. An available Alpine Premium Audio System provides you with crisp sound quality. This audio system comes with nine speakers, a rear subwoofer, and a 552-watt 12-channel amplifier. It is also easy to keep the interior of the Wrangler clean because of the one-way floor drain valves and carpet that can be easily removed. For enhanced comfort, you can choose available heated front seats and a heated steering wheel. The steering wheel also features controls for audio, voice, phone, and more. Another interior feature that enhances comfort is available Dual-Zone Automatic Temperature Controls, which allows you and your front passenger to customize the temperature settings. You can easily start the Wrangler with the waterproof Start/Stop button, and there is also an available Trail Rail System that keeps items in the back secure. The Trail Rail System comes with two aluminum rails and a rail that is mounted inside the tailgate. You can get a glimpse at the interior of the 2019 Jeep Wrangler near Denver at our authorized Jeep dealership serving Denver consumers. There are a variety of mechanical features that come with the new Wrangler. The Rubicon trim comes with front and rear Dana 44 axles that are made with thick tubes and forgings for superior capability, rigidity, and strength. There are three available 4×4 systems that you can choose with the 2019 Wrangler that include the Selec-Trac 4×4 System, the Command-Trac 4×4 System, and the Rock-Trac 4×4 System. The Selec-Trac comes with a full-time mode that can seamlessly transition from two- to four-wheel drive when needed, and the Command-Trac comes with a shift-on-the-fly system that offers a 2.72:1 low range that is perfect for rock crawling. With the Rock-Trac, which is standard on the Rubicon, you get a NV241 off-road transfer case, a 4:1 low gear ratio, and a Tru-Lok electronic locking front and rear differentials. The Wrangler also comes with 4-wheel disc anti-lock brakes. Would you like to find out more about the exterior of the 2019 Jeep Wrangler in Denver area? Stop by Pollard Jeep to see the exterior for yourself. Two engines are offered with the Wrangler. The 2.0 Direct-Injection Turbo engine can tow up to 3,500 pounds and produce 270 horsepower with 295 lb.-ft. of torque. For additional power, you can choose the 3.6L Pentastar V6 engine. This engine can crank out 285 horsepower with 260 lb.-ft. of torque. The engines are paired with a six-speed transmission, or you can choose an available eight-speed automatic transmission. To find our more about the powertrain of the 2019 Jeep Wrangler near Denver, contact Pollard Jeep serving Denver Colorado consumers. The Wrangler offers you and your passengers exceptional protection with a suite of safety and security features. The ParkSense Rear Park Assist System uses innovative sensors to help you during parallel parking and when you are backing into tight spots. There is also the ParkView Rear Back Up Camera that comes standard with every trim and provides you with a clear image of the back of the SUV when you are in reverse. The Wrangler also offers Trailer Sway Control that helps to keep trailers stable by applying brake pressure and adjusting the engine throttle. Other standard safety features with this model include Electronic Stability Control, advanced front airbags, advanced Brake Assist, Traction Control, a Tire Pressure Monitoring Display, and more. Contact Pollard Jeep if you have any questions about the safety features of the 2019 Wrangler. Are you ready to take the 2019 Jeep Wrangler for a test drive in the Denver area? If you are, contact Pollard Jeep serving Denver Colorado consumers. Our dealership offers the 2019 Jeep Wrangler near Denver and welcomes to opportunity to help you get behind the wheel of this capable SUV. Visit us today to learn more about all that it has to offer.